Richmond is a key actor in British Columbia’s huge ‘Hollywood North’ film and television sector. Many productions are shot here, from blockbuster movies to cult TV shows. Our photogenic cityscapes, historic sites, and natural settings have starred on screens large and small—and enticed travelling fans to visit their favourite set locations or catch new productions filming on our streets. One of the most notable TV shows ever filmed here is ABC’s Once Upon a Time. The village of Steveston played the small town of Storybrooke on the show from 2011 to 2017, and local businesses and landmarks can easily be spotted in the background. Much of the filming came to life on Moncton Street where many businesses had fictional Storybrooke alter egos. Popular attractions such as the Gulf of Georgia Cannery National Historic Site and London Heritage Farm also featured on the show. Learn more about the Real Storybrooke here. 2014’s big-budget Godzilla was shot in B.C. and beyond. 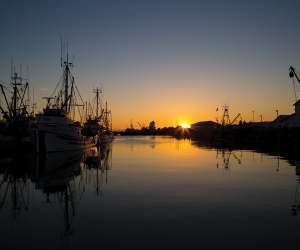 But Richmond’s Steveston Village was a vital backdrop for battling the scaly critter, especially at Fisherman’s Wharf. 2018 comedy Overboard, staring Anna Faris, repurposed several Steveston spots, including Rocanini Coffee Roasters, Steveston Community Park and the Buck & Ear pub. Steveston’s Once Upon a Time-starring Romania Country Bread also found itself onscreen in 2010’s Zac Efron vehicle Charlie St. Cloud. 2016’s Power Rangers filmed at multiple Steveston locations, including the Gulf of Georgia Cannery National Historic Site and on and around Moncton Street. If you see a sudden gathering of large white trailers here, you’ve likely found a film set. It’s worth stopping to watch the action – and you may spot a star or two. To find out what’s filming before you arrive, keep an eye on our Twitter feed; we sometimes mention productions in progress and where to find them. If you already know about a movie or show that’s usually filmed in Richmond, find out if it’s currently in production here via the handy Creative BC website. Did you know that Steveston plays Storybrooke in the TV series Once Upon a Time? Check out what’s happening in Richmond. Whale watching, go-karting, escape rooms—there is always something new to discover.